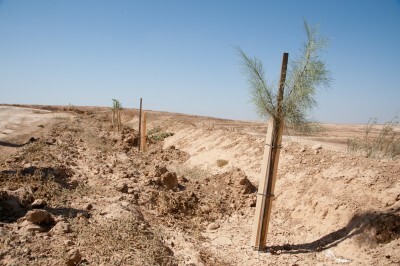 In April 2009, a plan was submitted by the Jewish National Fund (JNF) for the afforestation of the area north-west of the Bedouin township of Lakiya in the Negev. The plan did not take into account the existence of unrecognized villages in the area and, if approved, would have significantly limited the possibilities for development of Lakiya and would entail the demolition of dozens of homes without offering an alternative solution for their residents. Bimkom filed a planning objection on these grounds on behalf of the town’s residents and the District Planning and Building Committee partially accepted our objection. As a result, the JNF reduced the size of the planned forest by 1,200 dunams. However, in terms of future natural growth, Lakiya would still require additional 1,800 dunams which were still allocated for the planned forest area. Thus Bimkom appealed on behalf of the residents again. In November 2011, the JNF accepted our claims, and agreed to relinquish the land and return it to Lakiya. This allows Lakiya to plan its ongoing development in the surrounding area in order to meet the residents’ needs. Thanks to Bimkom’s intervention, some 3,000 dunams, including several unauthorized homes, shall now be included as part of the township. This entry was posted in Planning Assistance, What's New. Bookmark the permalink.